School food directly affects students’ health, learning, and lifetime wellness habits. It can also play a powerful role in driving positive change in our nation’s food systems. At HSC, we take a systems approach to transforming school food and recognize the powerful role that policy plays in determining what students find on their cafeteria trays. Fuel learning: Healthy meals support schools’ core mission of education, especially when it comes to boosting students’ concentration, focus and cognitive function. A vast body of research shows that improved nutrition in schools leads to increased focus and attention, improved test scores and better classroom behavior. Support healthy habits and consistent messages: Nutritious school food helps students develop lifelong healthy eating habits. It also contributes to a culture of wellness at school, reinforcing nutrition education messages from teachers. Healthy school food can also increase school connectedness and reinforce to children, families and community that students’ health and well-being are valued. Drive change in the marketplace and food system: We see school food as a lever for food systems change. School food is a $16.3 billion federally funded program. This use of public dollars creates an important opportunity and responsibility for a policy discussion about nutrition standards, procurement and food systems. Strong nutrition standards in the school meal program can drive changes in the consumer markets. School food also influences the taste buds and values of the next generations of consumers. School food is shaped by policy at three key levels: The federal government funds the program, sets nutrition guidelines and outlines general policy; states manage the programs; and local school districts implement them. The National School Lunch Program is fundamentally a federal program that was originally created “as a measure of national security” as so many recruits were rejected from military service in World War II because of malnourishment. The federal government continues to play a primary role in funding and defining the program. Recent years have brought significant progress for school food policy at the national level. Now, this progress is at risk of being rolled back. 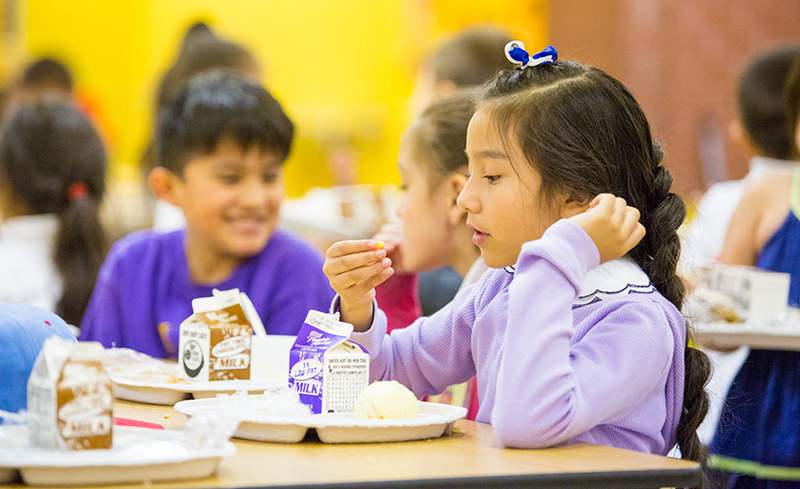 Authorizing the USDA to bring the nutrition standards for the school meal program into alignment with the latest science-based dietary guidelines for the first time in more than 15 years. Creating a federally-funded farm-to-school program. Establishing guidelines supporting consistent healthy messages throughout the school, including limits on junk food advertising in schools. Providing a community eligibility provision, which increased access to healthy school food in districts with high percentages of low-income students. The new nutrition standards authorized by this policy went into effect in the fall of 2012. These standards brought significant progress, adding more fruits and vegetables and more whole grains while trimming excess calories, fat and sodium. Research shows the nutrition standards have largely been a success in schools: Studies suggest that students prefer the new, healthier school meals; school meal participation is trending upward; and children are consuming more fruits and vegetables at school and throwing away less food. Implementing the standards has not been without challenges, as school food service staff worked through the trial and error of developing new menus and helping students accept the healthier options. Now, evidence suggests this work has paid off: the USDA reports that 95 percent of schools across the country are meeting or exceeding the healthier meal standards. A recent poll from the W.K. 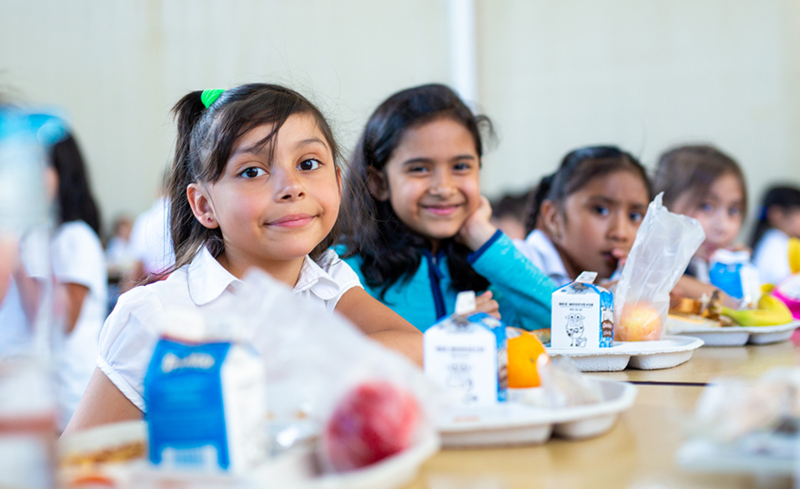 Kellogg Foundation found 86 percent of Americans support the current school nutrition standards, and 93 percent of Americans think that serving nutritious school food to students is important. Yet the new standards have been subject to intense political attack from some members of Congress and food industry lobbyists. Both supporters and opponents have begun to mobilize as Congress gears up for reauthorizing this program. Hearings have begun taking place in Congress and marker bills have been introduced. HSC is focused on ensuring that the voices of those speaking up for healthy school food—especially the students whose health is affected so directly—are heard. Read more in What We’re Doing and What You Can Do. States play an important regulatory role in implementing the National School Food Program; they also set policy in several key areas where federal policy creates room for states to determine their own standards. Many states also provide additional funding to support the school meal program. States set other policies that affect the school food environment, such as requirements related to food allergies and other medical conditions. Many states also set policies to prioritize healthy school meals through initiatives such as Farm to School. As a result of this flexibility, state policy and implementation strategies vary widely across the country. To see where your state stands, see the National Association of State Boards of Education State School Health Policy Database School Meals section. For innovative examples of successful state efforts to promote healthy school food, see Promising Practices of State Child Nutrition Programs. For more, see What You Can Do. Local school district policy shapes food directly as districts are responsible for implementing the program in schools. For example, school districts hire food service staff, build and maintain kitchen facilities, and decide how much time students will have to eat lunch. They create menus and make decisions about how food is procured, how it’s prepared and how it’s presented. Parents and community members can play an important role in advocating for a strong wellness policy. See What You Can Do for more. Much of our school food policy work at HSC is informed by our work on the ground at the local level in Chicago. In particular, our approach focuses on 10 interconnected pathways to excellence in school nutrition developed by parent and stakeholder school food advisory groups that we co-convened with Chicago Public Schools. Learn more about what we’re doing. HSC’s work to transform school food focuses on policy change at the national, state and local levels. Because the program is shaped significantly at each level of policy, we need alignment on all three levels to achieve the goal of fresh, healthy meals for every student. Empowering school stakeholders, including students, parents and school food service leaders. Advocating for policies that promote healthy school food. Building the capacity of local, state and federal institutions to support and implement health-promoting policies. At the national level, efforts to roll back progress on school food policy have centered on the myth that students universally reject healthy school food. At HSC, we believe the most powerful and relevant response to this is from the students themselves. As a result, much of our national food policy work focuses on making sure that often-unheard student voices are part of this debate. 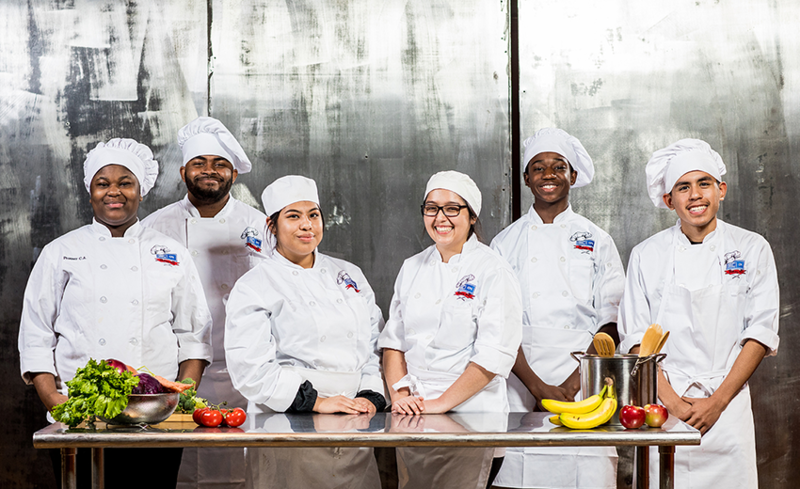 We do this work through Cooking up Change, a competition for high school culinary students challenging them to create a healthy school meal that their peers will enjoy. Winning teams from across the country travel to Washington, DC, each year for a national competition; while in DC, the students spend two days on Capitol Hill talking with political leaders and even presenting the healthy school meals they’ve created. Their culinary creations are proof positive that healthy school meals can taste great and appeal to students. Learn more about Cooking up Change and what you can do. At the state level, HSC advocates for policy in Illinois to support healthy school food. HSC focuses on support for robust implementation of the standards determined in the Healthy, Hunger-Free Kids Act and particularly on building schools’ long-term capacity to support healthful school food programs. As at the national level, we also work to elevate student voices in the state policy dialogue about healthy school food through Cooking up Change. For example, the winning student chefs from Cooking up Change Chicago each year present their meal to the Illinois State Board of Education and share their perspective on the value of healthy school food. As HSC works for change on a national level, we are grounded in a special focus on Chicago Public Schools, where more than 85 percent of the district’s 400,000 students come from low-income families. We focus on empowering school stakeholders, advocating for district-level policies for healthy school food, and building the district’s capacity to procure and serve fresh, healthy food in a pleasant environment. In particular, we are motivated by a vision for school food centered on ten interconnected pathways which are critical to the success of school food programs. We developed these pathways through our work with parent and stakeholder school food advisory groups we co-convened with Chicago Public Schools. Read more about the pathways and our work for school food in Chicago. In addition to our work in Chicago, we provide tools and resources to support parents and other advocates in making change in their own communities. See our Resource Center for more. Your voice is especially vital as we approach a moment of risk and opportunity for national school food policy. As Congress gears up to reauthorize the National School Lunch and Breakfast Programs, the progress we’ve seen for healthy school food over the past five years—including science-based nutrition standards—is facing intense political attack from food industry lobbyists and some members of Congress. You can raise your voice in support of healthy school food policy by urging your elected leaders to maintain the recent progress supporting healthy food and healthy students. We’ve made it easy for you to send a letter to your Congressional representatives by simply entering your ZIP code via the following link. You can use or revise the letter that we’ve created, or write your own. Start your letter here. Because state-level school food policy varies greatly from state to state, the crucial first step for advocates seeking change at the state level is to understand your state’s particular policy environment. An excellent starting point is the National Association of State Boards of Education State School Health Policy Database, which includes state-level detail about policies focused on school meals, competitive foods, wellness policies and more. For highlights of successful strategies used by state agency leaders to promote healthy school food, see Promising Practices of State Child Nutrition Programs. We encourage you to speak with leaders at your school to understand their school food challenges and opportunities, talk with parents about what they see, and learn about any advocacy organizations who may be working on this issue in your state. Based on this information, you can identify the most practical approach to creating change. See HSC’s Resource Center for more. Many key policy decisions about school food are made at the local district and school levels. Your voice matters in your community! We encourage you to get involved in your school’s wellness committee, learn about your district’s Local School Wellness Policy, and talk with students about their experience with school lunch. For more, see our step-by-step guide to creating change through a school wellness committee. Seemingly small decisions at the local and school level can have a tremendous impact. For example, a recent study found that adding just five minutes to students’ available lunch time led to a big jump in the amount of fresh produce they ate. As a nonprofit organization, we rely on support from people like you so we can continue to make schools healthier places where all children can learn and thrive. Your gift—large or small—will make a meaningful difference. Access related resources below, or go to our main Resource Center to access resources across all of our program and policy areas. This report presents findings from surveys conducted with 26 producers in nine states, highlighting economic impact assessment findings from two case studies: Minneapolis Public Schools and the state of Georgia. The purpose of this policy is to ensure the Board’s expectations for a healthy school environment are articulated and satisfied by establishing requirements for nutrition education, physical activity and the provision of healthy food choices at schools. The purpose of this policy is to establish nutrition standards, requirements and recommendations for foods and beverages sold, provided or served to students at school that compete with food provided under the National School Lunch Program (NSLP), National School Breakfast Program (NSBP), Seamless Summer Option (SSO) and the Child and Adult Care Food Program (CACFP). This policy seeks to create a school environment that supports student nutrition and healthy food choices by providing nutrition standards for food and beverages sold 1) as competitive foods in vending machines or in school stores, 2) by food vendors on school grounds, 3) as a la carte items sold in the school dining centers, 4) as part of school fundraisers, celebrations or rewards. The nutrition standards set forth in this policy are consistent with the USDA’s Smart Snacks Guidelines and the gold standard for competitive foods. This policy establishes the requirements for providing breakfast after the bell in all Chicago Public elementary, middle, and high schools. This policy establishes alternative breakfast models by which breakfast after the bell will be implemented. Models include but are not limited to: Breakfast in the Classroom (“BIC”), Grab n’ Go, Second Chance Breakfast, Breakfast Vending or a hybrid of those models to be determined by the Office of Nutrition Support Services. This policy seeks to create a school environment that supports breakfast participation by all students, encourages students to embrace a morning routine that includes breakfast and creates a healthy start to each school day. We can create a better future for our children and our nation by improving health in schools. The next President of the United States has the opportunity to support states, school districts and communities in creating the conditions of student health and wellness and giving all children a chance for a healthy, brighter tomorrow. This document outlines Healthy Schools Campaign’s recommendations to the next President for improving health and education for our nation's students. The goal of this project was to examine the impact of Smart Snacks in School standards on fundraising practices in districts and schools in a sample of states that allow and do not allow fundraiser exemptions. This study used a series of interviews with key stakeholders to explore the successes, challenges, and financial aspects of implementing these new policies regarding fundraisers and the ways in which schools may or may not have succeeded in transitioning to non-food fundraising strategies. This report focuses on key themes that emerged through the interviews, including barriers and challenges, and ways of addressing them. Welcome to Read the Label, the “next generation” of FDA’s award-winning Spot the Block outreach campaign! Originally launched in 2007, this comprehensive program from the FDA has evolved into a nationwide grassroots initiative. Through this hands-on campaign, kids, families and community outreach leaders unite with the goal of using the Nutrition Fact Label as their everyday tool for making smart and healthful food choices. FoodSpan is a free, downloadable high school curriculum that highlights critical issues in the food system and empowers students to be food citizens. It is aligned to national education standards in science, social studies, health, and family and consumer sciences. This curriculum stimulates debate about crucial food system topics related to human health, the environment, equity, and animal welfare. The Johns Hopkins Center for a Livable Future developed FoodSpan as a natural outgrowth of the work it does to help build a healthier, more equitable, and more resilient food system. US children attend school for at least 6 hours a day and are exposed to multiple opportunities to make decisions that affect their health during this time. Schools can use the Whole School, Whole Community, Whole Child (WSCC) model to create environments that help students make healthy choices. The WSCC model includes the school nutrition environment and services, which refers to the foods and beverages that are available to students throughout the school day and information and messages about food, beverages, and nutrition that students encounter on school grounds. A healthy school nutrition environment makes it easier for students to make healthy choices by giving them access to nutritious and appealing foods and beverages, consistent and accurate messages about good nutrition, and ways to learn about and practice healthy eating. Within a healthy school nutrition environment, school nutrition services provide meals that meet federal nutrition standards for the National School Lunch Program and School Breakfast Program, as well as the health and nutrition needs of all students. They also help make sure that foods and beverages sold outside of school meal programs meet Smart Snacks in School nutrition standards. This guide is a resource for school food leaders and manufacturers alike who are committed to improving the overall quality, nutritional value, and safety of food provided to all students in every school. It highlights unwanted ingredients to eliminate, or those to watch out for, as new food products are developed and others are modified. © 2019 Healthy Schools Campaign.